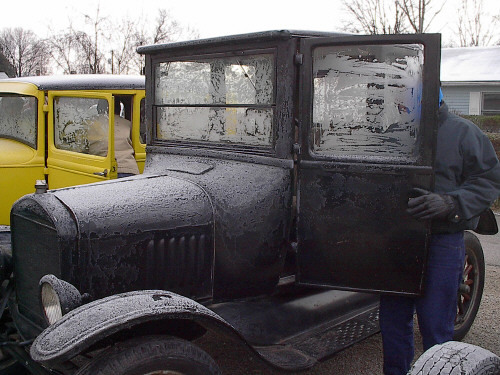 The February meeting was held at Jack Putnam's shop in Bluffton. Bob Torbet led the dinner meeting with 13 members and guests in attendance. The treasurer's report was read and approved. Checks for MTFCA insurance and newsletter supply were approved. Dave Benny reviewed the library procedure for restoration tapes and CD's of 20 yrs of The Vintage Ford Magazines. There are 7 CD's from 1966 to 2000. Ray Sutton proposed a Winter Club sponsored Swap Meet. He reviewed ideas used by another club that he belongs to. This event would require club member participation. 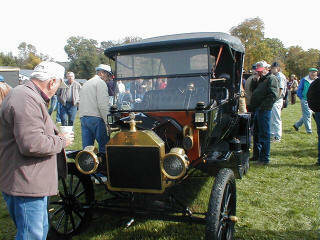 Bob Torbet presented a video program of his recent weekend to the Snowmobile Model T meet in Lancaster, New Hampshire. 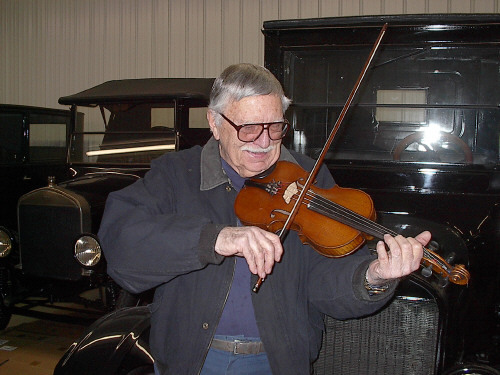 Bill Seiberg gave a short program on Dave Benny's violin that he refurbished. Can we say that Bill has been know to "fiddle" amongst the T's??? We are a very diverse group. 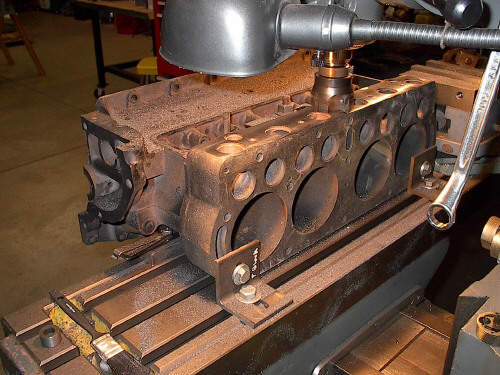 A demonstration was given to the club members on the methods used to "reconfigure" the serial number on a block using a milling machine. According to the owner, "some of the numbers had gotten out of order" and "needed to be placed back in the correct position". We tried to get a weekend tech day going in February; but, it faile because of snow. Please come to the March meeting with ideas for a project to get your T on the road. 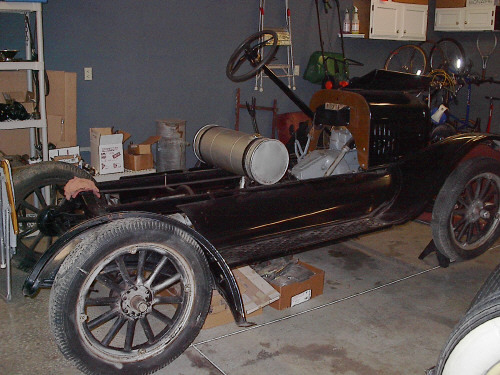 Through the early years of automotive engineering, many inventors tried to come up with a way to make the Model T ride a little smoother. 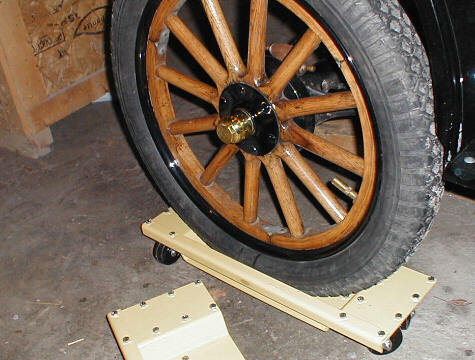 The leaf spring had come to the early car as a hold over from the buggy days and was thought to be the answer to riding comfort. Unfortunately, the new driving public wanted the suspension to keep up with the advances in horsepower and reliability. Inventors all over set out to invent a better mouse trap. 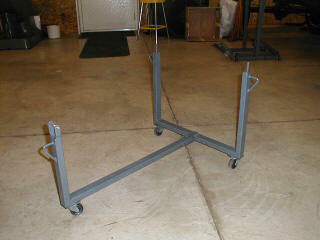 Many have seen the coil spring shocks that are mounted to the spring perches. Some are even doubled. I'll try to get pictures for the next issue that show a sprung strap method. The secondary spring arrangement in the picture was found on Bob Torbet's new project car. It looks like the idea is to add a little more spring back at the perch. 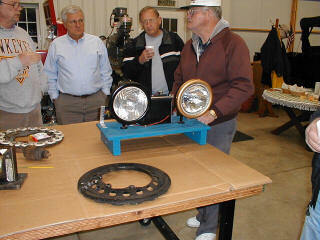 Here are a couple of photos of projecs that were checked out at a T meeting. 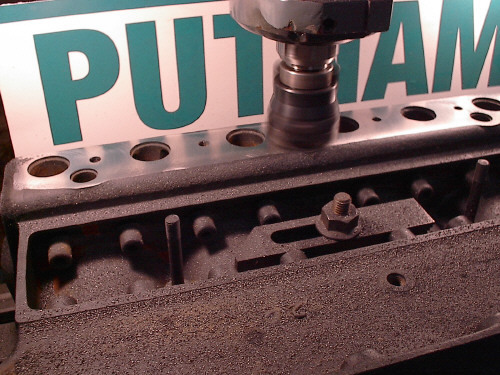 Two of the photos show the re-facing of the manifold side of a block damaged by years of seepage through the head gasket which had deeply pitted the block to the extent that it would have been difficult to get a good seal with the manifolds. 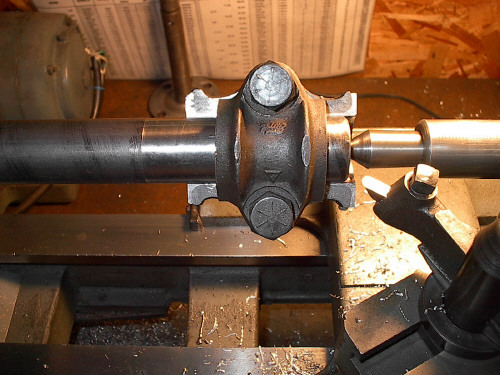 The lower photos show the facing on a lathe of a new rear main bearing cap thrust surface. 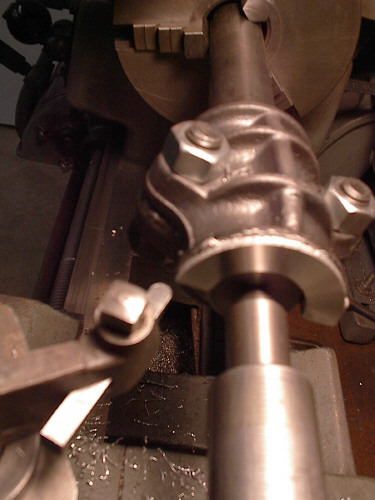 The bearing cap is mounted on a center shaft which has been ground to match the crankshaft size it will fit. 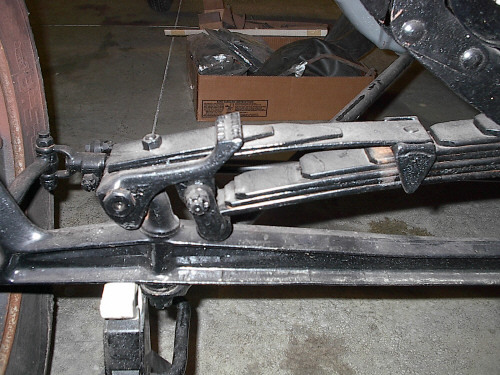 Judicious use of a dial caliper is needed to assure accurate fit to the crankshaft. Bill Seiberg is not only an accomplished body man. He is also a very fine violin maker/technician/player. If you go to his shop, you will also find a room full of violin an viola necks, bodies, bridges, tail pieces, bows and tuning pegs. Here we see Bill demonstrating the beauty of a violin that he restored for Dave Benny. T's Are Still Out There, If You're Willing To Look! 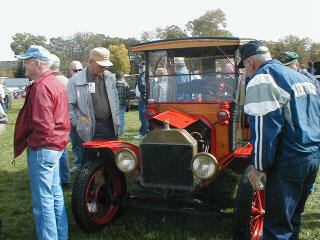 Every month finds a load of T's in the Model T Times and The Vintage Ford magazines. The problem is, by the time we see the magazine, someone else has already scarfed the good buys. So, we go around complaining that we can't get a drivable T at a decent price. I've found that this a figment of the imagination. T's still seem to be popping out of the woodwork in Ohio. Here a few of the example that has been on the market with in the last year. it find a new owner. The cab, bed, and chassis are intact and very solid. The tires are solid rubber. The engine is "stuck" and will not turn over. The truck has sat inside a garage for a number of years. I've told the family that I would contact the club members to see if anyone would be interested in this unit or would know someone who might be interested. 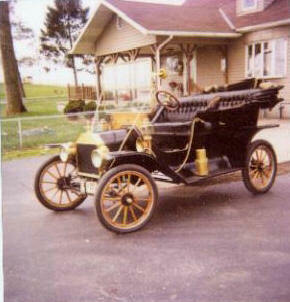 The family also has a late 20's Prospect fire truck to sell. I've seen this unit as well. It also is a very solid piece. There is a broken piston in the #1 cylinder of the engine. Asking price for the pair is $9000. I'm sure that they would split them up.